This article was written By Tom Kent-Williams on 02 Apr 2013, and is filed under Uncategorized. Produced initially as a film based on the popular video game fighting franchise Tekken, The Avenging Fist was almost instantly slapped with a lawsuit and resurfaced with only minor leftovers to hint at its video game-based past. With a script by Wong Jing and with two directors on-board, along with a cast of veterans and young talent, could anything be salvaged from the rubble of the once-hotly anticipated special effects extravaganza? Set deep in the future in the year 2050, Kong (Wang Lee-Hom) seeks to obtain the Power Glove, a weapon with mass-influence and power. Before he came to be, an experiment involving the Power Glove shaped his mother and father’s destiny along with a handful of survivors. Nova searches to learn the truth about his father and stop an evil known only as Combat 21 who plans to take over the government with the help of it’s mythical force. 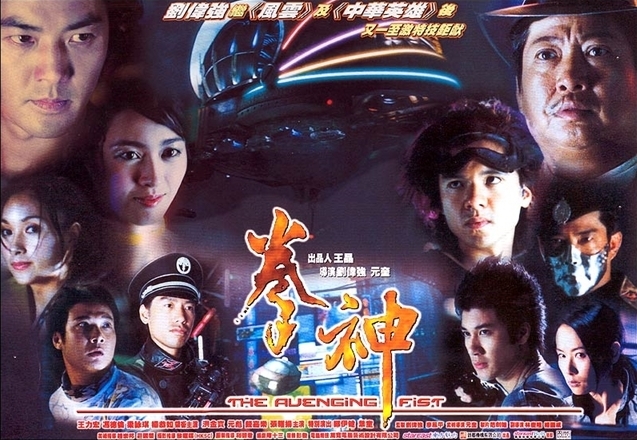 The stylistic choices and futuristic overtones of the film are apparent almost instantly when viewing The Avenging Fist. Rather than plucking from any weighty or important science fiction landmarks of the last few decades, our preliminary director, Andrew Lau, seemingly lifts the film’s aesthetic from Danny Cannon’s much-reviled 1995 adaption of Judge Dredd. Because of this stylistic choice, we are presented with a film that’s not so much a dark vision of the future but instead a film that is grounded in a overwhelming feeling of camp, from supporting star Sammo Hung’s silver cowboy-hat (which is made even more ridiculous when, in one scene in the film, he is in a boardroom with a collection of people wearing nothing but every-day, very non-futuristic suit and ties) to the overabundance of leather and vinyl costumes even incidental characters are seen wearing. Speaking of Sammo, the seasoned-actor/director is given a somewhat meaty role, although sadly, no space to present any form of action prowess. Along with Sammo, we have Yuen Biao cast against type as Thunder, one of the main henchman in the film who comes to play a pivotal role in the narrative, although depressingly, is depth-wise dormant and only given the opportunity to act as a brain dead brute the entire film. Wang Lee-Hom, our leading man, is pleasant, if not a force great enough to carry the picture and Kristy Yeung, our damsel in distress is far too restraint in her role, often reciting dialogue in a manner not honest to the emotion or situation of the character in that particular scene or part of the film. The attempt at raising emotion, particularly near the end of the film involving both her and co-star Stephen Fung is sappy and pitiful in both the acting on offer and haphazard narrative choice they are dealt with. Also thrown into the mix is Roy Cheung as a malicious techno-Nazi who’s constant rambling is at odds with the fast paced nature of the film and Chin Ka-Lok who sadly, close to 40 at this point in time, appearing as a supposedly youthful, rebellious scamp on a sky-scooter, part of the same group of friends 10 years his junior. What’s left of any semblance of a live-action Tekken appears to have most probably been left on the drawing-room floor. Apart from a couple of characters somewhat resembling their video-game counterparts, the story, setting and most of the characters are a world-apart from the grounded, martial-arts tournament world of the aforementioned franchise. Tekken comparisons aside not only is the above-mentioned Combat 21, played by Roy Cheung, resemble a live-action M. Bison, the constant mention of the elusive ‘Power Glove’ will most probably leave children of the ’80s in a Wizard-induced daze. As with much of the technology in The Avenging Fist, which is uninspired, creatively speaking (the answer to communication in this future are finger phones – yes, finger phones. In this, one of the most uninspired examples of future-tech presented in the film, the fault seems to be more a factor of budget rather than imagination) so are the fight scenes. When it comes to the action, what is on show here is, unsurprisingly for a Andrew Lau film, but surprising for a film co-directed by Corey Yuen, very stylized. With a reliance on CGI, not to enhance, but more than often to create. Power orbs, waves of thunder, clouds of light and the actors themselves at times are formed in fairly dated CGI and engage in high-flying, almost turn-based RPG-style brawls. That’s not to say there isn’t some hand-to-hand based combat present because there is, but what minuscule amount on offer here is not worth speaking of. The vast, but vacant battles could be placed into the eye-candy category at a stretch. Maybe back in 2001 this all seemed fairly cutting-edge, but today the special effects look strikingly average and are most definitely unengaging. For me, practical effects will nearly always age better than computer-generated ones and here, a film released just over a decade ago, now serves as a prime example of that notion. Not to say that this particular part of the film is a complete failure- the staccato, jerky way in which the film is edited around Thunder’s moves and attacks in particular definitely give the impression of speed and deadliness and is effective- but not particularly easy to follow. The film has far too many puzzling stylistic and narrative choices (including a cameo by Ekin Cheng playing a young Sammo Hung which seems more like a gratuitous cameo of a then-immensely popular young star) and stellar performances and lightweight action scenes that make the film tough to endure. It’s somewhat commendable for the filmmakers to have produced a viable commercial product after such a major set back early on in the film’s creation. Also praise-worthy is the fact the film is not only fluffy, but director Andrew Lau embraces the fluff, embraces the light sci-fi tone and revels and celebrates in the film’s shortcomings as a (nearly) celluloid video-game. Not only is Yuen Biao’s character, Thunder, visually comparable to The Wonderful Wizard of Oz’s Tin Man, The Avenging Fist as a piece of film also similar to the iconic L. Frank Baum character; both are shiny, sleek and sadly, lacking a heart. Unlike the Tin Man, though, this film is more than happy to function without one. Tom Kent-Williams is an amateur writer currently residing in Birmingham, England. He has been in love with Asian cinema since seeing Akira for the first time and has a slight man-crush on Chow Yun-fat. Hong Kong cinema floats his boat big time, along with synthpop, retro gaming and cups of tea in large mugs.